Official statement of particulars containing key provisions regarding the employment agreement to be provided to an employee when they commence employment. In accordance with the Employment Rights Act 1996, all employees must at minimum, be provided with a written statement of the particulars of their employment no later than two months after they commence their employment. This document ensures your compliance if you do not provide the information in a formal contract. 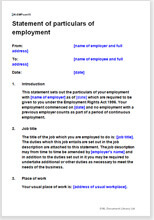 Suitable for use when you have employed a new employee and have not yet completed the employment contract or you do not intend to use a formal contract. Whether you choose an employment contract or a written statement depends how comprehensive and formal you want your employment agreement to be. This statement can be used either if you are still negotiating the contract after the first two months of employment, or simply if you do not intend to use an employment contract because you prefer the simplicity of this statement. This statement may be particularly useful if you have just started employing people and want to cut the formality of using contracts. This document has been revised to include the latest model Disciplinary and Grievance porcedures as recommended by ACAS. Authorisation by the employee that they have received understood the document. This document was written by a solicitor for Net Lawman. It complies with current English law. "I have used you in the past and am always impressed!" "The service received is excellent and extremely fast. For busy agents, this service is an absolute gem." "Easy to use website, good value for money, easy to edit and easy to understand document."